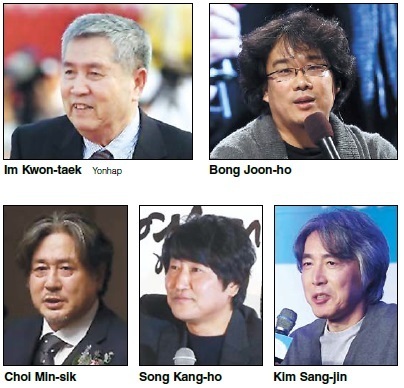 Five Koreans became eligible to vote in the Oscars, as the academy added new members, the Korean Film Council said Saturday. The Academy of Motion Picture Arts and Sciences invited Korean filmmakers Im Kwon-taek and Bong Joon-ho and actors Song Kang-ho, Choi Min-sik and animator Kim Sang-jin of Walt Disney as part of a group of 322 new members in an attempt to increase the diversity of its members. “It’s gratifying to acknowledge the extraordinary range of talent in our industry,” said Cheryl Boone Isaacs, president of the AMPAS, in a press release. The members can vote for candidates for the Oscars. Membership is by invitation only, which requires sponsorship by two existing Academy Award members and the approval of the Academy’s board of governors. Veteran filmmaker Im Kwon-taek is known for his numerous films, including “Painted Fire,” “Chunhyang” and his 102nd film “Revivre,” released in March this year. Choi Min-sik, best known for his role in “Oldboy,” recently starred “Lucy,” Luc Besson’s sci-fi blockbuster. Actor Song Kang-ho starred in the 2013 “Snowpiercer,” directed by Bong Joon-ho.